Making Magazine recently published a DIY project that sounds fun. It's earrings using vintage lace and beads. I'll bet you could find some pretty cool vintage buttons to use as well. Here is the article, including instructions and links to the source. Lace is ideal for earrings as it is lightweight. The trend for chandelier-style earrings translates well into lace because, when stiffened with glue, it is possible to use the weave of the lace in place of metal filigree. The lace of this white daisy earring was simply stiffened with glue. A flat sew-on cabochon was stitched to the centre and fine silver chain used to make a vintage cut-glass bead dangle. A smaller bead connector joins the lace flower to a Sterling silver earring wire. 1. Put a couple of teabags in a small bowl, pour on boiling water and leave to brew for a couple of minutes. Remove the teabags, dissolve a little salt into the solution and drop the lace into tea. Leave it for at least one hour, depending on how deep you want the colour to be. Rinse thoroughly and leave to dry. 2. Snip apart the individual flowers of the lace. Be sure just to cut the connecting threads and not cut into the flower itself. 3. Lay the lace flowers right side facing down onto a piece of waxed kitchen paper. Brush the backs of the lace with fabric glue using a flat brush. This process will not only seal any rough edges and prevent fraying, but will also give body to the lace by stiffening it. After a few minutes move the lace a little to make sure it is not stuck to the paper. 4. When the glue is completely dry, stitch any beads or flat stones to the lace centre by hand. 5. Make any dangles, connectors or drops using the relevant beads, head/eye pins and jewellery pliers. Thread jump rings directly through the lace design at the centre top and bottom of the piece. 6. 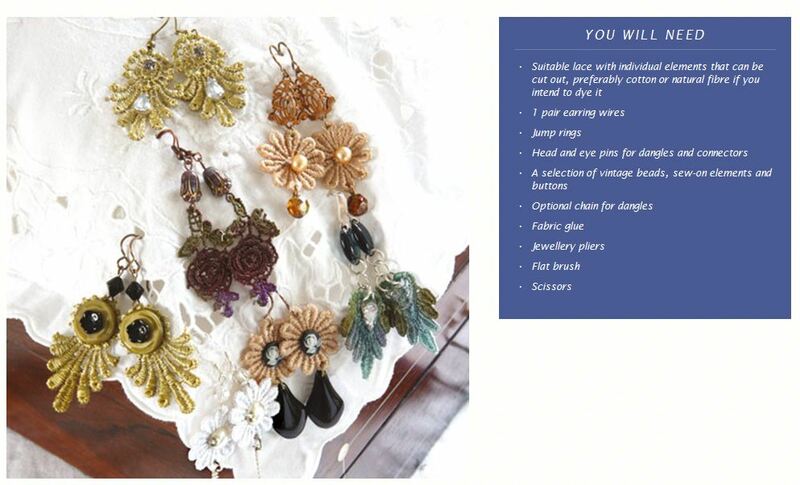 Attach dangles and earring wires via the jump rings. 7. The finished pair of 1930s style lace earrings. TIP To make your white lace look more vintage, you can simply age it artificially by dying the lace with tea. Soaking for one or two hours gives a faded tan tone. Remember, this process will only work with cotton and viscose lace and not with synthetics.